With approved use of the Cambridge English Corpus, Dr. Charles Browne, Dr. Brent Culligan and Joseph Phillips have created a New General Service List (NGSL) of core high frequency vocabulary words for students of English as a second language . First published in early 2013, the NGSL provides over 92% coverage for most general English texts (the highest of any corpus-derived general English word list to date). Use the pulldown menu to download the NGSL in various forms, and to try out our large and growing number of free online tools for learning, teaching, testing, analysing and editing texts with the NGSL. Be sure to check out our other special purpose word lists which have been designed to work in a modular approach in conjunction with the NGSL - these include the New Academic Word List (NAWL), the TOEIC Service List (TSL), the Business Service List (BSL) and the New General Service List Spoken (NGSL-S). All of our corpus-derived word lists are public domain and available to you for free as long as you properly cite our work (how to cite is mentioned in the FAQ section). Enjoy! In 1953, Michael West published a remarkable list of several thousand important vocabulary words known as the General Service List (GSL). Based on more than two decades of pre-computer corpus research, input from other famous early 20th century researchers such as Harold Palmer, and several vocabulary conferences sponsored by the Carnegie Foundation in the 30s, the GSL was designed to be more than simply a list of high frequency words, its primary purpose was to combine both objective and subjective criteria to come up with a list of words that would be of “general service” to learners of English as a foreign language. However, as useful and helpful as this list has been to us over the decades, it has also been criticized for (1) being based on a corpus that is considered to be quite dated, (2) being too small by modern standards (the initial work on the GSL was based on a 2.5 million word corpus that was collected under a grant from the Rockefeller Foundation in 1938), and (3) for not clearly defining what constitutes a “word”. to create a list of the most important high-frequency words useful for second language learners of English, ones which gives the highest possible coverage of English texts with the fewest words possible. We will be doing our best to make this list available in as many useable formats as possible, including providing definitions for all words in easy English and uploading the NGSL to free online learning tools such as Quizlet. Please look around the site and leave comments for us to help improve both the site as well as the list itself. Although the NGSL was designed to help learners attain the highest possible coverage of general English with the fewest possible words, an important pedagogic question to consider is once these 2800 words are mastered, what words should learners study next? While continuing to study the next most frequency general English words beyond the NGSL seems a logical next step, two issues which the learner faces are (1) the number of words they need to learn to make an additional 1% coverage gain increases sharply after 92%, and (2) depending on the student's specialization, it is very likely that they will make significantly faster gains by learning special purpose vocabulary. One thing that needs to be noted is that when trying to read or listen to materials within a special purpose genre, the coverage offered by the NGSL will be a little different from what it offers for general English (sometimes lower and sometimes higher than 92%). Downloads of all of our special purpose word lists and associated free online learning and content creation tools are available from this website via the pulldown menu on the left. While we are all tremendous fans of the original Academic Word List (AWL) developed by Dr. Averil Coxhead, her AWL was made to fit together with, and be a next step for students and teachers using West's 1953 GSL, both of which were based on the concept of word families. With the publication of the 2013 NGSL, which is based on the concept of modified lexemes, we knew that we needed to create a new list of important high frequency academic words that would fit tightly together with the NGSL and therefore published the New Academic Word List (NAWL), which was based on a 288 million word academic corpus. Like the NGSL, the NAWL provides a bit better coverage than the original AWL. As you can see from the chart below, the combined NGSL/NAWL gives about 5% more text coverage than the combined GSL/AWL. More information about the NAWL version 1.0, including various downloadable versions of the list can be found using the pulldown menu on the left (or by clicking here). In May of 2016, Dr Browne and Dr Culligan published a 2nd special purpose word list, the TSL or TOEIC Service List, that was designed to be used as the next step after learning the New General Service List for learners who need to understand the texts and listening materials that appear on the TOEIC exam. Based on a 1.5 million word corpus of TOEIC materials, the 1200 words of the TSL (when combined with the 2800 words of the NGSL) provides up to 99% coverage of words that appear on the TOEIC test. More information on the TSL version 1.1, as well as a growing number of free TSL resources can be found on the TSL page from the pulldown on the left (or by clicking here). In July of 2016, Dr Browne and Dr Culligan published a 3rd special purpose word list, the BSL or Business Service List, that was designed to be used as the next step after learning the New General Service List for learners needing to comprehend general business English texts and materials. Based on an approximately 64 million word corpus of business texts, newspapers, journals and websites, the 1700 words of the BSL (when learned in combination of the 2800 words of the NSGL) provide learners with approximately 97% coverage of the English they need in most general business situations and materials. More information on the BSL version 1.0 as well as a growing number of free BSL resources can be found on the BSL page from the pulldown on the left (or by clicking here). In late 2013, Dr Browne and Dr Culligan analyzed the spoken subsections of the NGSL corpus and published a list of frequencies for spoken English known at the NGSL-S. The 1.0 version contained 822 words which provided up to 90% coverage for spoken English. In 2016, the 1.1 version of the list was published, with slightly better coverage (718 words to reach 90%). In October of 2017 the 1.2 version of the NGSL was released. This list is 721 words and provides up to 90% coverage for unscripted spoken English. Dr. Browne has been trying to disseminate information about the NGSL, NAWL, TSL and BSL through a series of academic presentations at conferences around the world including the 2013 World Congress on Extensive Reading in Korea, a Featured Speaker address at the 2013 National KOTESOL Conference in October, the 2013 JALT National Conference in Kobe, a Keynote address at the 2013 Korean Association of Corpus Linguistics, the 2013 Vocab@Vic Conference in New Zealand, 2 Keynotes at Cambridge Day Conferences in Taiwan in April of 2014, a Plenary address at KOTESOL National in May of 2014, a Featured presentation at the Vocab SIG of JALT in June of 2014, a Plenary at the TRI-ELE Conference in Thailand, a Featured Vocabulary Symposium at the AILA World Congress of Applied Linguistics in Australia in early August 2014, a Featured speaker address at the JACET National Conference in late August 2014, a Keynote address at the JALT Extensive Reading Conference at Keisen university in September of 2014, a Keynote for Kansai TechDay Plus in Kobe in October of 2014, a Keynote at the ICEE Conference at Shin Chein University in Taiwan in April of 2015, two Plenary Addresses given at a Professional Development Conference in June 2015, at Qatar University, Qatar, a Keynote address at the combined JALT, JASAL and Okayama University Language Education Centre Conference in July 2015, Plenary Talk in Sept 2015 at the TEFLIN Conference in Bali, Indonesia, a TEDx Talk in October of 2015 given at Tokyo International School in Tokyo, Japan and many more. New General Service List by Browne, C., Culligan, B., and Phillips, J. is licensed under a Creative Commons Attribution-ShareAlike 4.0 International License. Permissions beyond the scope of this license may be available at http://www.charlie-browne.com. NOTE: Development of the NGSL was made possible through approved access to the Cambridge English Corpus (CEC). 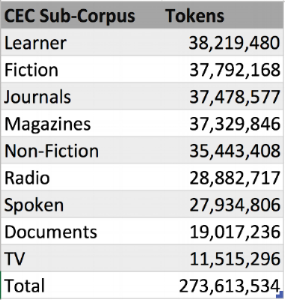 The CEC is a multi-billion word computer database of contemporary spoken and written English. It includes British English, American English and other varieties of English. It also includes the Cambridge Learner Corpus, developed in collaboration with the University of Cambridge ESOL Examinations. Cambridge University Press has built up the CEC to provide evidence about language use that helps to produce better language teaching materials.